Today Punxsutawney Phil emerged from his burrow around 7:30 a.m. ET and did not see his shadow, predicting an early spring for us all. February’s modern allure for an old favorite in the United Kingdom. Naturally, we grow Snowdrops, and quite nicely, however, we do not exalt them as the pretty perfect, short and sweet, little gems they are! Often asked why any right thinking American would bother to cross the Atlantic in dreary February of all months! Well, obviously, if you were a Galanthophile it would be purely for the Snowdrops! A dear friend hailing from Lincolnshire shared a nursery memory of ‘February Fill Dykes’, a somewhat vague tale recounting the dykes (ditches) filling over with water, only then would it stop raining. Having never heard the phrase verbalized I discovered there were several rhymes and poems on the subject. As well a very notable painting ‘February Fill Dykes’, exhibited at the Royal Academy in1881, by Benjamin Leader hangs in the Birmingham Museum and Art Gallery. With foul weather regularly peppering the evening news, most New Englanders are looking for the sun, however there are some of us wanting just a little more beauty than dried, peeling skin. Experience a new modern allure to the English countryside at a time of the year when you get almost as much attention as the Snowdrops. Take a pass on the glossy flower books, experience it, and take a walk with locals. One of the first harbingers of Spring; Galanthus, is a bulbous perennial, commonly referred to as ‘Snowdrop’, coming from the Greek wording gala ‘milk’, anthus ‘flower’. My knowledge of Snowdrop Weekends was happenchance. While spending a leisurely morning wrapped in the comfort of our London hotel I came on an article mentioning Snowdrop weekends. Open for exploration we rented a car and headed out. My shortlist of two has been cultivated by area. There are many gardens waiting to share with you, perhaps combine it with other interests but enjoy being treated as a special guest at a time of the year when you will not be lost but appreciated as a learned visitor. Our destination - Little Ponton Hall and upon first glimpse an idyllic 18th century country manor with a stream so crystal clear that if it wasn't rushing at such a speed I’d be tempted to bottle it and sell it on the spot. The house surrounded by gardens, woodland and open pastures seemed a natural partnership. Flourishing with lush plantings of Snowdrops and an equally bold mix of yellow Aconites. A glorious dry day, most local visitors owned a dog and had it trotting alongside them. Moving from the bucolic ancient churchyard back to the formal gardens, into the greenhouses and resuming to the front - do not miss the listed Dovecote House. Eerie, standing in and looking up and around, seemingly you’ve entered another civilization. The garden, opened for charity by Mrs. McCorquodale is an experience she and her neighbors willingly and luckily for us share. Benington Lordship Gardens; Circling around church and a quintessential English village sits a garden of ‘romantic disorder’ with heaps of charm, Norman castle ruins, a moat and a Folly, all seamlessly melding with a Georgian Manor House. The glamorous snowdrops are brushed throughout the steeply rolling lawns and paths, a gentle journey from ancient and gothic to newly implemented garden improvements. Keeping the garden relevant to today as well as securing its future. 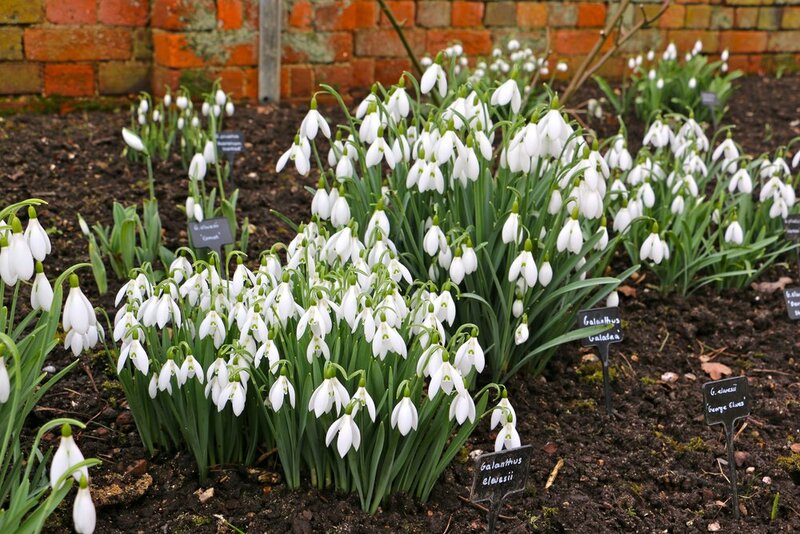 A highlight not to be missed is its named coveted collection of Snowdrops alongside the greenhouses. Once having seen this there will be no peace, you will forever be smitten to the variety of Snowdrops to be acquired. Welford Park; built on the site of a monastery, then becoming a hunting lodge for King Henry V111, the existing Manor House dates back from 1652. It is not only know for it’s snowdrops but is also host to the extremely popular Great British Bake Off. It only takes one thing to bring a lasting impression for life and this garden has it in spades. It does not come meekly, entering through an avenue of trees solidly under-planted with the glorious Snowdrop, however it is a misnomer to think you have arrived. Standing on the bridge with its elevated vista, you can take in its bucolic river and formalized gardens around the house. As you enjoy exploring the grounds - don’t miss afternoon tea, which is served in the old stable blocks, all homemade by villagers for charity. When walking round the house it suddenly comes to you that this house is more special than you thought upon entering from the side of the property. Here the grand vista leading out is daunting, the yellow Aconites settling for second place next to the flash of white enveloping throughout the ground beneath the opulent avenue of trees. Although, again, it is a misnomer to think you have arrived. As I walked along the woodland paths the snowdrops seemed to get even lusher with every turn when surprisingly a brilliant sea of white appeared out of no-where of what looked to be a lake. Five acres of Snowdrops, some lush, some spotty but all proud, robust and tolerate, growing within these woods is what I was seeing. Absolute perfect growing conditions in the woods bordering the River Lambourn seemed to have produced what looks to be Snowdrops on steroids. As expected, gardeners are the most generous and optimistic of people, creating a new modern allure in February when nothing else can upstage it. Admittedly, it did rain, however, we completely lucked out while visiting our Snowdrops, the weather taking a break, just for us. This was our first glimpse of this rural phenomenon, which has now been elevated by many. 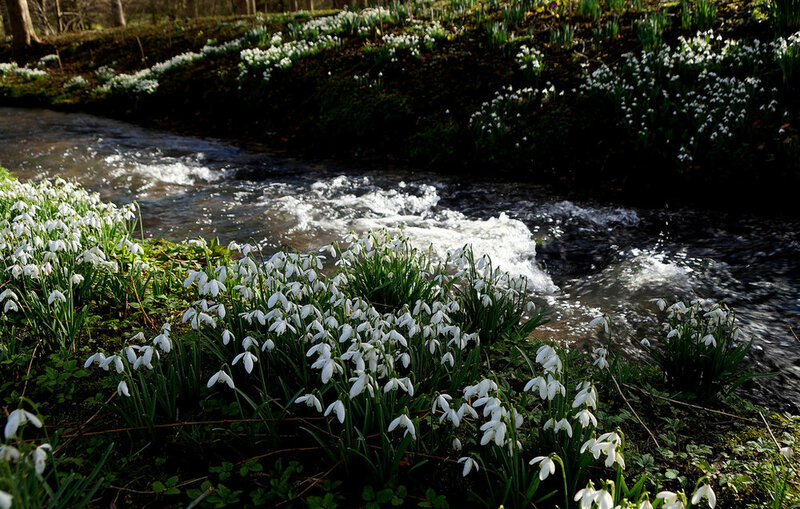 The National Garden Scheme present their fourth annual Snowdrop Festival with over 92 snowdrop gardens open across England and Wales. Click HERE for further information.